The year’s most colorful, fragrant season is upon us. The warm breeze is making its way up the peninsula from the south, inviting springtime travelers to head outdoors. With flower buds getting ready to brighten up the much-awaited spring, here are some the season’s best flower festivals to look forward to in the weeks to come. 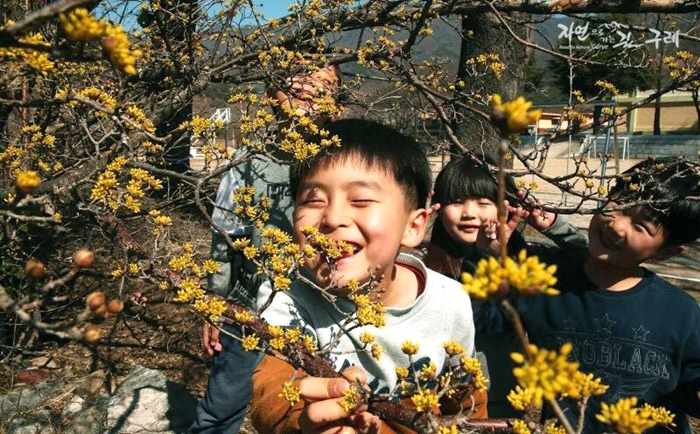 Yellow cornelian cherries will be the first to bloom, along the southern ridges of Jirisan Mountain in Jeollanam-do Province. The Gurye Sansuyu Village, located in this southern region, is responsible for over half of Korea’s cornelian cherry fruit production. Here, the Gurye Sansuyu Festival will take place from March 17 to 25, when the region’s 117,000 trees will be in full bloom, showing off their boughs of yellow petals. In Gwangyang, another southern town, white apricot blossoms will cover the Baegunsan Mountain alongside the Seomjingang River. 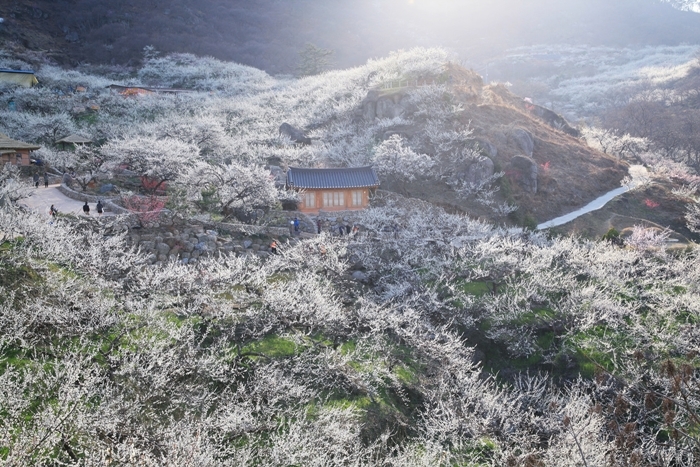 The Gwangyang International Maehwa Festival, with its spectacular views of white apricot blossoms covering around 33,000 square meters along the valleys at Baegunsan Mountain, will open from March 17 to 25 at the Maehwa Village in Gwangyang-si City. The mid-slopes offer the best vantage points, from where hikers will get views of the peaks dressed in spring’s white flowery fabric. Pink azaleas, white cherry blossoms and yellow cornelian cherries will flower at the end of March. The Yeongchwisan Azalea Festival will take place from March 30 to April 1 this year, at Yeongchwisan Mountain in Yeosu, Jeollanam-do Province. 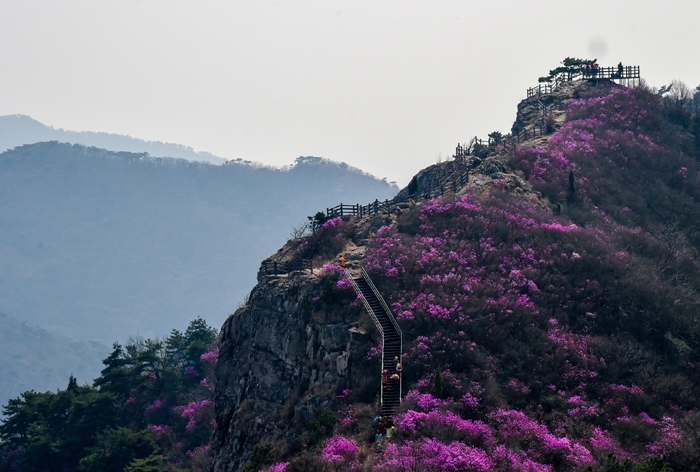 A 30-minute walk past Heungguksa Temple, and you’ll arrive at an expansive slope about the size of 140 soccer fields covered in pink azalea blossoms. 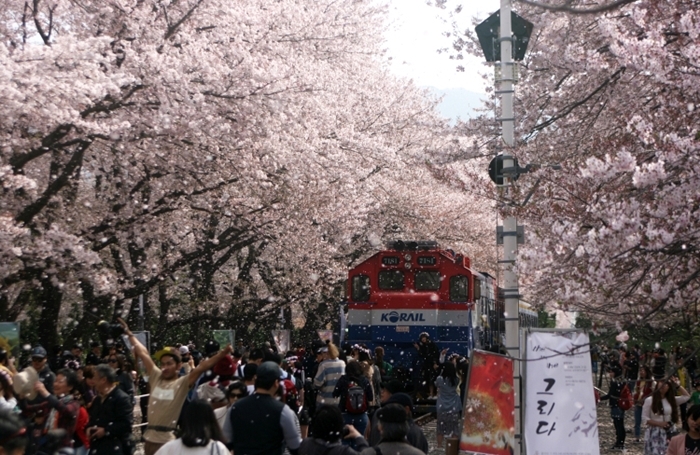 Around 36,000 cherry blossoms will once again sweep over Jinhae in Gyeongsangnam-do Province this spring. The Jinhae Gunhangje Festival will kick off on March 31 and run until April 10. The area around the Yeojwacheon Stream and Gyeonghwa Station are known as the best spots in Jinhae for taking photos of cherry blossoms. 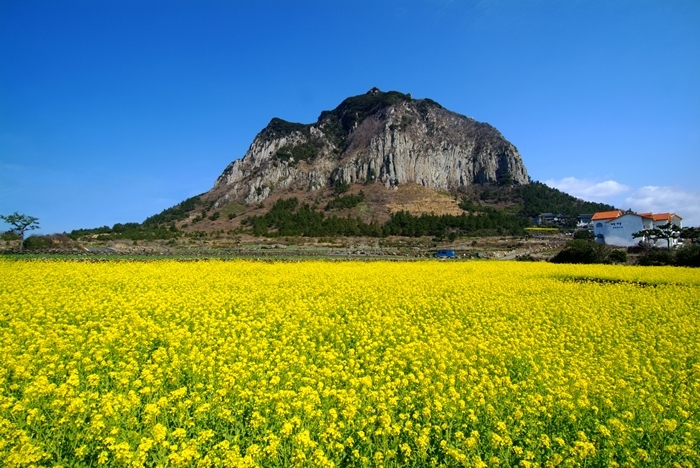 By the beginning of April, the canola flowers on Jeju Island will be in full bloom. You can catch the best views from the roads leading up to the Seongsan Ilchulbong Sunrise Peak, and the area surrounding Sanbangsan Mountain and Pyoseon Beach. Only on Jeju will you get to see the blue ocean, dark volcanic rock and fields of yellow canola flowers all in one picture-perfect frame. You can also enjoy these flowers at the Jeju Canola Flower Festival from April 7 to 15 at the Pony Park in Seogwipo City. More information about upcoming spring flower festivals can be found at the links below.